Ma befejezzük a hétfőn elkezdett új témánkat, a képes szótár, a hasznos párbeszéd és a síbaleset után ma egy "sportos" feladat következik. Alpine Freestyle: This style uses aerial acrobatics and balance, balance being necessary for rails. In this type of skiing, skiers do jumps or use rails to do aerial tricks. These tricks are developed in technique and style every day. Freestyle/Newschool: This is also a type of skiing with tricks. The skis are designed to do tricks backwards as easily as forwards. Tricks are generally spins and flips sometimes combined with grabbing the ski to show a good trick. Freestyle skiing takes place in terrain parks at ski resorts, with a wide variety of jumps, rails, etc. Freeskiing/Freeride: Freeriding is related to freestyle skiing but it’s done on the natural mountain. Freeride skiing has been growing in popularity in recent years as more and more skiers can afford gear and skis. Nordic Skiing: Also called Cross-country skiing or Cross-country racing. Takes its name from a type of ski race that is one third up, one third down, and one third flat. Cross-country races can be either freestyle or classic. In freestyle racing, any technique is allowed as long as it is human powered and on skis. In a classic race, skating techniques are prohibited. 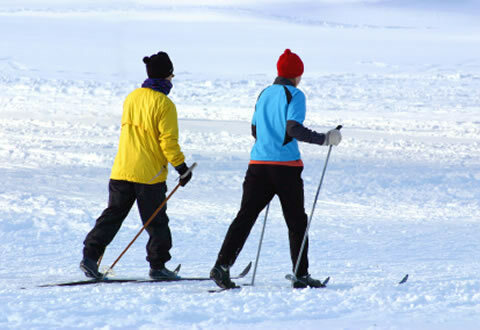 World wide, Nordic skiing may be the most popular form of skiing since it does not require a specialty ski area. Nordic Jumping: Also called ski-flying and ski jumping. A competition in which skiers slide down a ramp called a jump and attempt to go the furthest before landing on the ground. This is done with Nordic style skis, meaning that the heels of the boot and the binding are detached from the ski. The skis are much longer and wider than other types of skis and jumping is typically done without ski-poles. Telemark skiing: It is also known as "free heel skiing". Just as in Nordic skiing, the skis have a binding that only connects the boot to the ski at the toes. But in that case, skiers go downhill.